Herbert Family Genealogy – HFA – Herbert Family Association Inc.
HFA - Herbert Family Association Inc. The “Family Tree”, the genealogy of the Herbert and associated families, is available to view and search on Ancestry.com. This is the official Herbert family tree and is a private tree which can only be viewed by people with access authorised by the HFA. 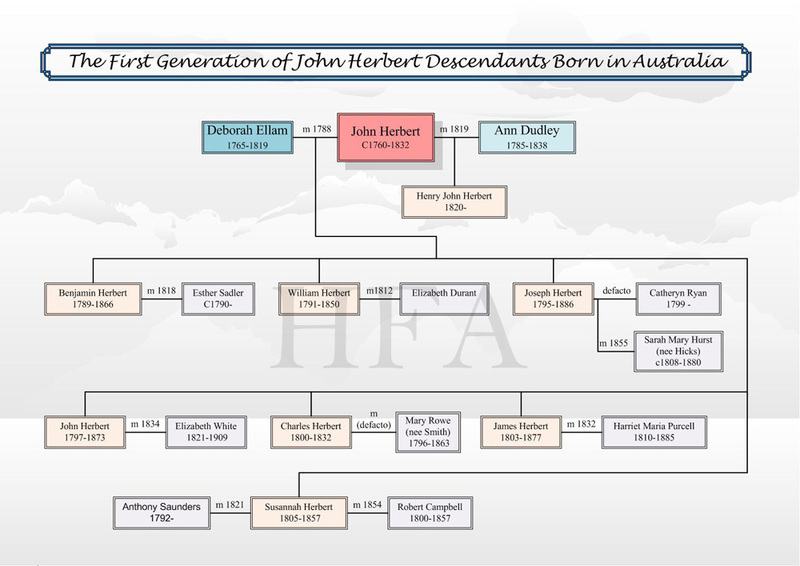 If you are a member of the Herbert Family Association, you will receive an email advising – “you have been added to our family tree First Fleeter John Herbert, on Ancestry.com”. The email continues to explain how you access the tree. If you do not already have an account with Ancestry.com, you will need to create a free guest account (follow the link on the email). Once you are registered with Ancestry.com, click on the Ancestry button above. The Ancestry search page will open, hover the mouse over the Family Trees tab and select “Herbert” from the drop down navigation menu and the tree opens. Now you can navigate to where ever you want to in the tree. You will not be able to edit the tree but, if you see anything you believe is an error or omission, you can send a comment via the Contact Page. If you are submitting information such as BDM dates please include the source such as a certificate number so we can be sure the information is accurate. We are happy to receive any information relative to the genealogy, but all information will be evaluated before it is added to the Ancestry database. The tree, now on Ancestry, started life in 1987, on paper; people who attended the 1988 HFA reunion will remember seeing the very large sheets of paper with hand drawn trees representing the different branches of the family. After the reunion, we used an early family tree program to start recording people and relationships and eventually transferred from that early program to Family Tree Maker which we still use today. The data in the tree has come, initially, from family members, from research by the first HFA archivists Jean Bellamy and Elsie Cuthbert, and, over the years, from research by many other family members. The data base has been maintained by Gwen Herbert since the beginning and much information has been added since 1987. However, we know there are many omissions and inevitably there are errors. We hope that family members will review their own branch of the family tree and add to it by sending us missing data and advising where they find errors. When information is sent to us, we would appreciate copies of certificates where they are available, and it is mandatory that the source of the information is identified. Watch this area for the latest updates. If anybody is having difficulty logging in to the website please contact the webmaster via the Contact HFA Page. Membership fees for 2018 are shown on the Registration Page. Added notice re changes to NSW association law - see Constitution page. Fragment 115, June, 2018 is now available under the Newsletter menu tab. © 1987 - 2019 Herbert Family Association Inc. All rights reserved.